The Cote D'Ivoire (Ivory Coast) flag was officially adopted on December 3, 1959. Its design is modeled after the French Tricolore. The orange shade represents the savanna grasslands, green represents the coastal forests, while white is symbolic of the country's rivers. 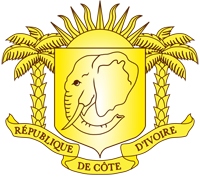 The coat of arms of Cote d'Ivoire features a shield with the head of an elephant that is supported by two palm trees. The elephant is an important symbol for the nation, as it was the source of ivory for which the country is named. The rising sun above the shield symbolizes a new beginning.